What do you need to know from an interview to confidently make a great hire? What kind of questions should you ask to get the information you need? It’s safe to say that we’ve all gone through an interview, either as an interviewee or an interviewer. Whether it’s for school, an internship, or a job, the interview is a process used to gather information to determine if we have the skills, experience, and fit for a particular organization. The main goal of the interview is the same: to gather enough information to make a decision. How organizations go about getting that information often times differs. Eighty-four percent of respondents review the candidate’s resume to initially determine if the candidate is viable for a position. For those who are qualified, 94% of respondents then conduct a phone interview to further determine qualifications. Candidates who pass the phone interview then move on to an in-person interview. This process is consistent across industries. The central part of the recruiting process is the interview itself. The interview gives hiring managers the opportunity to clarify questions and obtain more detailed information on the candidate. As mentioned in the previous post (Part I: What are your Biggest Interviewing Challenges) many hiring managers are not trained on how to interview. Therefore, it’s not far off to say that the interview is different from one hiring manager (HM) to the next based on the HM’s style and approach. This begs the question if some candidates are given an unfair advantage over others due to a lack in structure and standardization across the interview process. Two areas worth examining to add structure to interviews are the types of questions asked and the goals for the interview. Based on the survey results, hiring managers ask a variety of questions when they interview candidates. Below are the main types of questions asked and some areas of concern to consider for each type. In alignment with the industry, 81% of respondents indicate that the main type of questions asked are behavioral questions. These types of questions ask candidates about a past situation and how they performed in that situation. An example question would be, “Describe a stressful situation at work and how you handled it.” Hiring managers hope that learning about the candidate’s past performance will help them predict future performance. Things to consider: While it’s important to get insight into a candidate’s past behaviors, behavioral questions are not as effective as hiring managers hope due to the fact that candidates can prepare canned responses through researching online (i.e., teaching candidates how to turn weaknesses into strengths.) Additionally, the format of these questions give candidates a guideline on how to answer, again allowing the candidates to prepare their responses. A third issue, and a question to ask yourself is: Will the candidate be put in the exact same environment or situation in your organization? If the answer is no, then the response to the behavioral question is moot; the insight obtained is not applicable to the functions of the role in which the candidate is interviewing. After behavioral questions, skill-related questions are the most commonly asked in an interview. Seventy-five percent of respondents ask skill-related questions to gauge whether the candidates have what it takes to do the job. This includes hard skills, such as knowledge of technological tools and experience with certain research methods, as well as soft skills, such as leadership and adaptability. Hard skills are easier to determine since they can be gleaned from past work experience. Soft skills, on the other hand, are more difficult to assess. Things to consider: A candidate’s skills can be found on the resume, even though it’s only a summary. Since the interview is for a short amount of time, hiring managers should think about getting information they need that they do not have access to, so that time with the candidate is used effectively. Additionally, hiring managers should be careful when knocking out candidates based on skills. Although some skills are essential for certain jobs, others can be taught or trained on the job. For skills that can be learned, it’s more important to determine if the candidate has the aptitude to learn and quickly be brought up to speed. Outside of behavioral and skill-related questions, hiring managers mostly ask candidates about experiences found on their resumes; sixty-eight percent of respondents say they do this in their organization. It’s understandable that hiring managers ask questions about the resume; they want to get clarity and more details on the candidates’ past employments to get insights on experience, skill set, level of responsibilities, etc. Things to consider: Although it’s good to get clarity on previous work experiences, asking questions based on a resume allows the candidate to control the interview. Candidates know their own resume better than anyone; the experiences they put on the resume are the ones they hope you ask them about. And as mentioned previously, is this information that you need? Is this a good use of the interview time? We can also add structure to the interview process by having set goals for the interview. The types of interview questions asked are usually tied to the goals the hiring managers have for the interview. Below is a chart of the most common goals HM’s have based on responses from survey participants. It’s no surprise that determining skills and cultural fit are at the top of the list, given the fact that the top interview questions are behavioral questions and skill-related questions. This makes sense given the correlation between happy and productive employees and their skillset to do the job, and how they feel about their work environment. 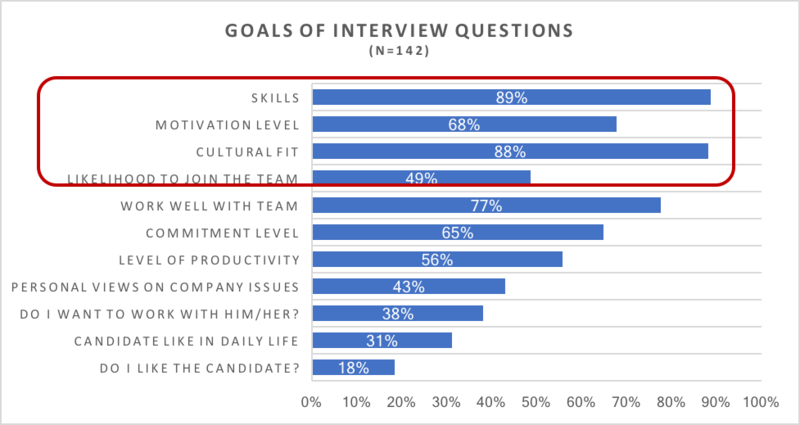 Aside from skills and cultural fit, more than half of the respondents point to determining the candidate’s motivation, commitment, and productivity level, and whether the candidate will work well with the team as other pertinent goals of an interview. The goals that are not as essential are ones relating to personal views of either the interviewer or the interviewee. 1. Can they (the candidates) do the job? 3. Will they fit in the company culture? 4. Will they join the team? Good news: Survey respondents are mostly meeting all four objectives! Their focus appears to be on the skills and the cultural fit with the organization, rather than the motivation level of the candidate. An area that is not as fleshed out in interviews is the candidate’s likelihood to join, with only 49% of survey respondents stating that they include questions that speak to this goal. While it’s understandable to allocate more time to gather information about skills, motivation, and fit, failing to “sell” the job and getting the candidate to “buy” the job will leave you where you started –with an unfilled position. Knowing that time is limited, what should hiring managers focus on during interviews to effectively use the time they have with the candidates? Here’s a checklist of five things to consider the next time you sit down to interview a candidate. I hope the checklist helps you to better organize your time, and more importantly, helps you to make more frequent and quality hires!